Ursula Kroeber Le Guin (pronounced /ˈɝsələ ˈkroʊbɚ ləˈgwɪn/) (October 21, 1929 - January 22, 2018) was an American author. She has written novels, poetry, children's books, essays, and short stories, most notably in the fantasy and science fiction genres. First published in the 1960s, her works explore Taoist, anarchist, ethnographic, feminist, psychological and sociological themes. Le Guin was one of the pioneers of a sub-genre of science fiction known as feminist science fiction. Feminist science fiction uses the science fiction genre to examine feminist themes such as equality among the sexes and the distribution of power in society, biological and gender differences based on reproduction, and the relationship of gender to social organization. In the Left Hand of Darkness, Le Guin creates a utopian society in which gender differences play no role in determining power and position as a means of reflecting on the relationships in human society. Her feminist themes are nonetheless intertwined with her other social, political and religious/spiritual concerns in a way that has drawn criticism from some feminists. Unlike some science fiction, Le Guin's work is less concerned with the importance of technological change and development on human culture, and more interested in using alternative models of society to examine the social, gender and spiritual dimensions of human society. Le Guin was born and raised in Berkeley, California, the daughter of anthropologist Alfred L. Kroeber and writer Theodora Kroeber. In 1901 Le Guin's father earned the first Ph.D. in anthropology in the United States from Columbia University and went on to found the second department, at the University of California at Berkeley. Theodora Kroeber's biography of her husband, Alfred Kroeber: A Personal Configuration, is a good source for Le Guin's early years and for the biographical elements in her late works, especially her interest in social anthropology. Le Guin received her B.A. (Phi Beta Kappa) from Radcliffe College in 1951, and M.A. from Columbia University in 1952. She later studied in France, where she met her husband, historian Charles Le Guin. They were married in 1953. Their first child, Elisabeth, was born in 1957 in Moscow, Idaho, where Charles taught. In 1958 the Le Guins moved to Portland, Oregon, where their second daughter, Caroline, was born in 1959, and where they lived thereafter. During this time, she continued to make time for writing in addition to maintaining her family life. In 1964, her third child, Theodore, was born. In later years, Le Guin did some work in film and audio. She contributed to The Lathe of Heaven, a 1979 PBS Film. In 1985, she collaborated with avant-garde composer David Bedford on the libretto of Rigel 9, a space opera. Le Guin died on January 22, 2018, at her home in Portland, Oregon, after having been in poor health for several months. Le Guin became interested in literature when she was very young. At the age of eleven she submitted her first story to the magazine Astounding Science Fiction. It was rejected. Her earliest writings, some of which she adapted to include in Orsinian Tales and Malafrena, were non-fantastic stories of imaginary countries. Searching for a publishable way to express her interests, she returned to her early interest in science fiction and began to be published regularly in the early 1960s. She received wide recognition for her novel The Left Hand of Darkness, which won the Hugo and Nebula awards in 1970. Much of Le Guin's science fiction places a strong emphasis on the social sciences, including sociology and anthropology, thus placing it in the subcategory known as soft science fiction. Her writing often makes use of alien cultures to convey a message about human culture. An example is the exploration of sexual identity through an androgynous race in The Left Hand of Darkness. Such themes place her work in the category of feminist science fiction, although she is not singularly interested in questions of gender, but how they intersect with other social and political concerns. For example, her works are also often concerned with ecological issues. The Left Hand of Darkness explores gender by creating a gender neutral society in which sexual difference appears to play no role, although love and jealousy remain. While the world she creates is a peaceful society, the reason for this remains open to interpretation. The It could be due to the Gethenians' unique biology (the absence of a deep sense of duality implied by strong gender divisions may cause the Gethenians to lack a necessary component of nationalism), or it could simply be a side effect of the planet's harsh climate, limiting warfare to small skirmishes by simple economics. Also related is the far slower pace of technological development. The Gethenians are mentioned as having gone through a very slow-paced and gradual industrialization, with many semi-feudal social institutions left intact, rather than the breakneck industrial revolution which Earth experienced since the 18th Century. In one episode, it is specifically mentioned that a particular type of truck has been in use for centuries, almost unchanged, and that Gethenians feel no special need to improve on it and develop a more advanced model. Like the above, this may be related to the absence of a sharp male/female dichotomy, or may simply be a side-effect of Gethen's meager natural resources, which are deficient not only in pure raw materials, but also in certain forms of inspiration (Genly Ai speculates at one point that the Gethenians' failure to invent the airplane may be due to the planet's lack of birds). In fact, Le Guin examines gender related questions surprisingly little, and provides even less in the way of answers. As the novel focuses instead on in-depth examination of curiously toned-down and blended distortions of subjects like Feudalism and Communism, Zen-like eastern mysticism and Christianity, this may in fact be a very subtle answer to the question of gender: "It's not important." Gethenians in Karhide do possess an elaborate system of social prestige called shifgrethor, in which individuals jockey for position by subtle maneuvering—the exact kind of social conflict seen in homogeneous groups (compare office politics). The demonization of others is artificial and temporary; alliances shift easily, and prevailing cultural mores are determined and protected by the next clearest division between groups—geography. Nations exist, and different places have different societies, but they blend at the edges. Low level raiding of indeterminate value preserves a sense of hostility and division that is useful for internal political purposes, but there is little real desire to actually conquer another nation. Indeed, the concept of full-scale war is unknown to Gethenian societies. But it seems possible that Gethen is now drifting towards a war between Karhide and Orgoreyn. The book features two major religions: the Handdara, an informal system reminiscent of Taoism and Zen, and the Yomesh or Meshe's cult, a close-to-monotheistic religion based on the idea of absolute knowledge. Handdara is more archaic and dominates in Karhide, while Yomesh is an official religion in Orgoreyn. The difference between them underlies political distinctions between the countries and cultural distinctions between their inhabitants. Estraven is a follower of Handdara, which motivates many of his actions. Le Guin makes use of the ordinary actions and transactions of everyday life. For example, in "Tehanu" it is central to the story that the main characters are concerned with the everyday business of looking after animals, tending gardens and doing domestic chores. While she has often used otherworldly perspectives to explore political and cultural themes, she has also written fiction set much closer to home; many of her short stories are set in our world in the present or near future. Several of Le Guin's science fiction works, including her novels The Dispossessed and The Left Hand of Darkness, belong to her Hainish Cycle, which details a future, galactic civilization loosely connected by a organizational body known as the Ekumen. Many of these works deal with the consequences of contact between different worlds and cultures. The Ekumen serves as a framework in which to stage these interactions. For example, the novels The Left Hand of Darkness and The Telling deal with the consequences of the arrival of Ekumen envoys (known as "mobiles") on remote planets and the culture shock that ensues. Unlike those in much mainstream hard science fiction, none of the civilizations Le Guin depicts possess reliable faster-than-light travel. Instead, Le Guin created the ansible, a device that allows instantaneous communication over any distance. The term and concept have been subsequently borrowed by several other well-known authors. Few of Le Guin's major works have yet been adapted to film or television. Her 1971 novel, The Lathe of Heaven, has been adapted twice. First, in 1980 by thirteen/WNET New York, with her own participation, and again in 2002 by the A&E Network. In the early 1980s animator and director Hayao Miyazaki asked permission to create an animated adaptation of Earthsea. However, Le Guin, who was unfamiliar with his work and anime in general, turned down the offer. Several years later, after seeing My Neighbor Totoro, she reconsidered her refusal, believing that if anyone should be allowed to direct an Earthsea film, it should be Hayao Miyazaki. Eventually The third and fourth Earthsea books were used as the basis of the 2005 animated film Tales from Earthsea (ゲド戦記, Gedo Senki). The film, however, was directed by Miyazaki's son, Goro, rather than Hayao Miyazaki himself, and Le Guin expressed mixed feelings toward it. 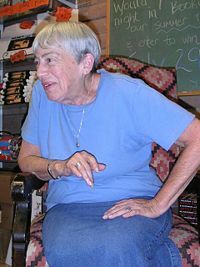 Le Guin is an important figure in the rise of the genre of science fiction in the second half of the twentieth century. Le Guin received several Hugo and Nebula awards, and was awarded the Gandalf Grand Master award in 1979 and the Science Fiction and Fantasy Writers of America Grand Master Award in 2003. She has received nineteen Locus Awards for her fiction, more than any other author. Her novel The Farthest Shore won the National Book Award for Children's Books in 1973. Le Guin was the Professional Guest of Honor at the 1975 World Science Fiction Convention in Melbourne, Australia. She received the Library of Congress Living Legends award in the "Writers and Artists" category in April 2000 for her significant contributions to America's cultural heritage. In 2004, Le Guin was the recipient of the Association for Library Service to Children's May Hill Arbuthnot Honor Lecture Award and the Margaret Edwards Award. She was honored by The Washington Center for the Book for her distinguished body of work with the Maxine Cushing Gray Fellowship for Writers on 18 October 2006. Robert Heinlein in part dedicated his 1982 novel Friday to Le Guin. Her New York Times obituary called her "the immensely popular author who brought literary depth and a tough-minded feminist sensibility to science fiction and fantasy with books like The Left Hand of Darkness and the Earthsea series"
Ursula Le Guin was a prolific author and has published more works than are listed here. Many works were originally published in science fiction literary magazines. Those that have not since been anthologized have fallen into obscurity. Note: Le Guin has said that The Eye of the Heron might form part of the Hainish cycle. The other tales are unconnected with any of her other works, except that Malafrena takes place in the same realistic-but-imagined part of Europe as Orsinian Tales. ↑ 1.0 1.1 1.2 Michaela Bushell, Helen Rodiss, and Paul Simpson, The Rough Guide to Cult Fiction (Rough Guides, 2005, ISBN 978-1843533870). ↑ Julian Steward, Alfred Louis Kroeber 1876-1960 Obituary American Ethnography Quasimonthly, Retrieved January 25, 2018. ↑ Ursula K. LeGuin, "Gedo Senki" Retrieved January 25, 2018. ↑ A Whitewashed Earthsea: How the Sci Fi Channel Wrecked My Books Slate.com, December 16, 2004. Retrieved January 25, 2018. ↑ Ursula K. LeGuin, "Gedo Senki" Retrieved February 19, 2009. ↑ Robert A. Heinlein, Friday (Hodder Paperback, 1983, ISBN 978-0450055492). ↑ Gerald Jonas, Ursula K. Le Guin, Acclaimed for Her Fantasy Fiction, Is Dead at 88 The New York Times, January 23, 2018. Retrieved January 24, 2018. ↑ Ursula K. Le Guin, The Other Wind Retrieved January 25, 2018. Lennard, John. Of Modern Dragons and other essays on Genre Fiction. Tirril: Humanities-Ebooks, 2007. Interview with Le Guin on her novel Lavinia on The Inkwell Review. Interview with Ramona Koval on on her novel Lavinia, on The Book Show, ABC Radio National. Chronicles of Earthsea Interview with Ursula K. Le Guin Guardian Unlimited, February 9, 2004. Interview in The Guardian, December 17, 2005. Radio Interview with Ursula LeGuin on Bookworm. Reviews, synopses, and cover art at FantasyLiterature.net. Interview about her Lavinia on National Public Radio's All Things Considered, April 26, 2008. Transcript of interview mainly about Lavinia on Australia's ABC Radio National "The Book Show" program, May 4, 2008. History of "Ursula K. Le Guin"
This page was last modified on 26 January 2018, at 21:12.